Sand on your camera? Wet towels covered in sand? Keys lost in the sand? This brand new, stainless steel, patent-pending umbrella hook will keep all your valuables off the sand while, keeping you relaxed at the beach! Perfect to hold towels on while the kids are swimming, they stay dry and sand-free! 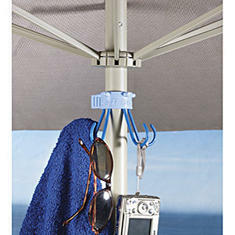 It installs and removes in an instant and clips on without having to lift umbrella out of the sand. Just walk up and clip it on! 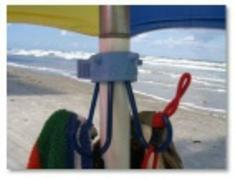 The Pole-R Bear “hugs” beach and patio umbrella poles up to 1 5/8” in diameter (standard size for most umbrella poles). Included is a clear adapter for use with skinner width poles 3/4" - 7/8" . EPDM Rubber (Bungee cord quality) strap with 4 coated hooks to clip around beach and patio umbrellas. Strap and hooks won't mar or scratch the pole. Comes in Blue only. Metal hooks and retaining clip are stainless steel and coated so they won't rust! Made in USA! Patent pending but in last stages. Patent examiner has approved claims. About 4 months away from full patent .